Gilles Villeneuve signed magazine clipping. This is a mounted (NOT professionally done!) 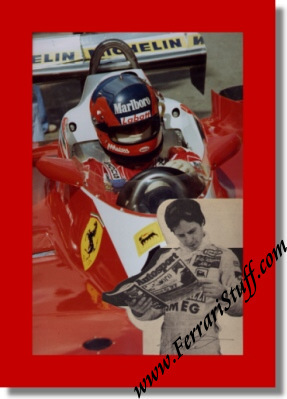 magazine clipping of the late Gilles Villeneuve (1950 - 1982) that was signed by Gilles. 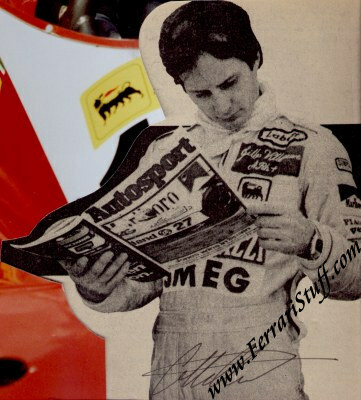 The clipping itself is not dated but appears to be an advertisement for Autosport magazine and the silhouette of Gilles was cut out of a large color photo of Gilles sitting in his Ferrari at the 1978 Long Beach Grand Prix. As mentioned, this is NOT a professional mounting. The total, including matting measures some 12 x 15 inches or 30 x 38 cm. A truly great opportunity and we only have 1 available of course.